EDUCATION & EMPLOYMENT. The potential for innovation in higher ed, alternative pathways, programs and flexibility across postsecondary is the subject of debate at the US Department of Education’s (ED) “Accreditation & Innovation” hearings this week, part of ED’s negotiating rule-making process. The highly bi-partisan effort embraced by people across higher ed, ed tech, the investment community and consumers appreciate the urgency of getting rid of 20th Century nostrums and regulatory straitjackets that create barriers to fresh thinking. They back the need to focus on the ability of institutions to develop innovative programs that are responsive to the needs of students and employers. Higher ed disruptors, including education company investors and ed sector experts gathered for the semi-annual Capital Roundtable hoping to drive dramatic change by early next year. YOU’LL HAVE TO TRY HARD TO AVOID UNIONS IN THE NEWS THIS WEEK. And kudos to the media for working hard to balance their false narrative that they are only working for better teacher conditions. The strike by teachers in the Los Angeles Unified School District – the nation’s second largest – has dominated education related headlines. Our leadership has been a much sought after voice of reason on this issue. 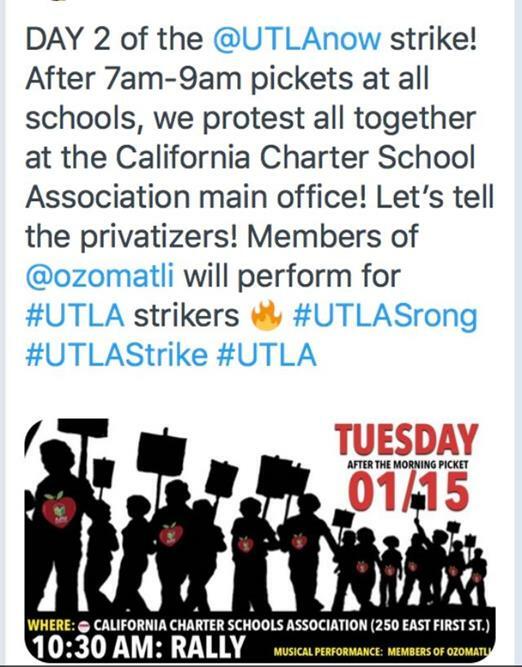 We’ve pointed out that their increased post – Janus decision opposition to the demand and success of charter schools in LA and elsewhere are driving many of their demands, with negative and misleading activities intended to turn parents who have experienced life-saving experiences in these innovative schools against them (see Exhibit A). Check out our comments in the Los Angeles Times , the Atlantic and some major dailies, as well as on talk radio on one of LA’s most listened to radio stations, KABC-FM. NEXT WEEK IS NATIONAL SCHOOL CHOICE WEEK. There’s a reason more than 20,000 events are organized to salute the options parents have utilized to educate their students in the manner that suits them best. Learn about those events, the cause, and the promise that has lifted boats for all children.